The soap and cleaning compound manufacturing industry in the United States, which produces such household products as laundry detergents, lime/rust removers and various other all purpose cleaners, was forecasted to generate about 61.06 billion U.S. dollars by 2016. A household cleaner has to be effective, gentle on users and appealing to the senses. Beneath the sink is a wide variety of cleaning products—some are used every day and others rarely. Manufacturers want to be sure that their product is not only safe, but the one reached for most often. Every household cleaner requires optimal combinations of ingredients such as surfactants, stain removers, brighteners, abrasives and sanitizers to ensure peak performance, but most need to be gentle on users’ hands and appeal to their senses. Procter & Gamble, an American multinational consumer goods company, is one of the leading vendors when it comes to consumer cleaning products. In 2016, the company controlled 56.1 percent of all liquid laundry detergent sales within the United States; which amounted to retail sales worth over 2.9 billion U.S. dollars. 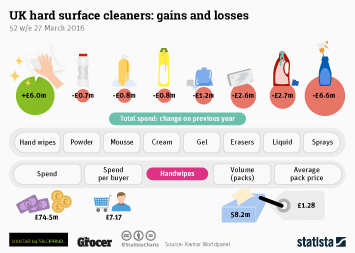 Import value of the cleaning manufacturing industry to the U.S.
More interesting topics from the industry "Cleaning Products"